For more than 80 years, Professional Builder has been the trusted source for business and product information for the U.S. home-building market. We help builders profitably run their businesses by delivering timely, executable business advice from our team of award-winning editors and industry experts. 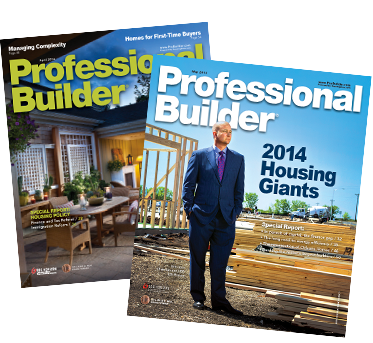 Each monthly issue of Professional Builder reaches nearly 121,000 professionals who build a vast array of residential construction — from single- and multi-family home builders to systems builders and modular builders. Our editorial platform is focused on helping companies of all sizes sustain and grow their businesses — from the very largest national firms to mid-sized regional builders to small-volume, diversified companies. This event is organized by SGC/SGC Horizon, which reserves the right, in its sole discretion, to limit or deny access to any entity or individual. This event is open to registration for building and remodeling professionals only. Industry suppliers and manufacturers must be registered as sponsors to attend the event. Members of the press may obtain permission to attend by contacting emileo@sgcmail.com. ® Copyright 2016 Professional Builder. All Rights Reserved.